Sea Witch wasn’t what I expected at all. I’m still not even sure if I actually enjoyed Sea Witch by Sarah Henning. It was a book that went places I didn’t expect and at some points felt like the author had simply added things without editing the previous section of the book to fit these new changes. The first 70% was also incredibly slow, which left me unfortunately bored. The last section of the book definitely made up for it but I don’t really enjoy being bored for most of the book I’m reading. 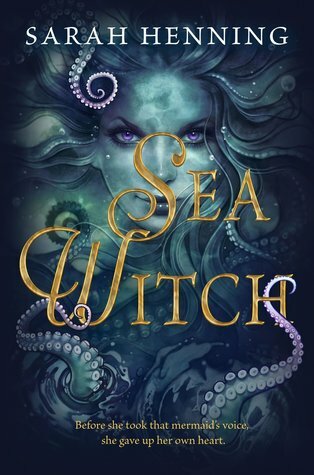 Sea Witch is being marketed as the story of Ursula, from The Little Mermaid, before she was Ursula. I was a bit taken aback by the story since it doesn’t exactly follow that storyline, instead follows Evie as she lives in a town where her best friend died years prior. Evie is best friends with the Crown Prince, Nik, of her hometown and the pair still mourn the loss of their best friend Anna who drowned in the sea that surrounds them. A girl appears in the little town and Evie can’t stop thinking that maybe it is her best friend, that maybe she had been saved and has returned all these years later to be back with her and Nik. However, this girl, Annemette, is certain that she is not Evie’s Anna but she desperately needs Evie’s help. Annemette, who is a mermaid, has come to land but only a few days to make sure Nik falls in love with her or else she will return to the sea as sea foam. It is the classic The Little Mermaid storyline with a twist, especially since the perspective of this story isn’t told from the mermaids perspective. We flash between present and past throughout the story, and get glimpses of what happened all those years ago when Anna was lost to the sea. I really enjoyed these glimpses to the past and felt they gave the story that added depth it needed for the plotline to carry through. There is so much interwoven into Sea Witch though, including magic, darkness and love. The story truly grew as it went. I’m still not even sure what to say about Sea Witch this book felt like a mess at times but it was honestly so enjoyable. I could barely put it down, which isn’t always a good sign (I read Caraval in my sitting and you can click here to see how that went). However, I think I did enjoy Sea Witch. This review isn’t being posted for some time, I read this book in August, so maybe my thoughts will have changed by then. I think the best part about this novel was that it was well written. Sarah Henning managed to make me enjoy a character-driven novel, a very rare occurrence for me on many occasions as I tend to get bored more times than not. The world that Sarah Henning creates in Sea Witch feels as if you can reach out and touch it. I’ve grown up surrounded by water my whole life but the author made it feel like it was it’s very own character in the book, that the ocean itself was the most powerful character in this book, which is true because the ocean should always be respected. I did wish this book had been told from Annemette’s perspective and there had been a greater focus on the magic of mermaids and just magic in general. I feel we only got small glimpses of it throughout the story and it only appeared very rarely. It would have been nice for that to have been a larger element, especially since the romances in this book felt like they were a little all over the place. Part of the reason that I believe I enjoyed Sea Witch so much was because I didn’t expect anything. A lot of reviews I have read said this book wasn’t what they wanted. They were expecting a dark version of The Little Mermaid and for Ursula’s story to be darker, grittier and full of negative energy. This book is definitely not that. There are touches of jealousy throughout the story but there is ultimately no extra level to the main character, Evie. She is simply happy to go along with anyone, whether that be the love interest or Annemette, and doesn’t really develop her own personality throughout the story. Overall, I still gave Sea Witch four stars. Despite all my complaints about the technical elements of the story I really did love how Sarah Henning wrote this book. There is such a beautiful weaving of history in the novel and discovering the land of another country. Plus, there was dancing, balls and celebrations and y’all should know by now that I am a sucker for anything royalty based. I have been wanting to read this and have been on the fence. Great review I will have to give it a chance. I agree that it was a bit boring at the end. I did just enjoy that there were a lot of Danish influences in it adding to the original Hans story.